The CC Certificate helps us work together to build an equitable, accessible, and innovative world through sharing open knowledge and culture. Welcome to the Creative Commons Certificate! The Certificate is an in-depth course about CC licenses, open practices and the ethos of the Commons. The course is composed of readings, quizzes, discussions, and practical exercises to develop learners’ open skills. This course is open to everyone, from university students and entry-level professionals to experts in the fields of library science and education (more fields forthcoming). The Certificate is a community development program, investing in people like you, who work in and advocate for open movements and the Commons. The CC Certificate powers you with knowledge to better advise your institution on creating and engaging with openly licensed works. You will learn how to adapt and innovate on existing openly licensed materials–keeping your institution’s knowledge base relevant and up to date. You will also learn how to best support learners accessing a wider array of open knowledge resources. Finally, the Certificate equips you with skills needed to meet open licensing requirements increasingly present in government and foundation grants and contracts. 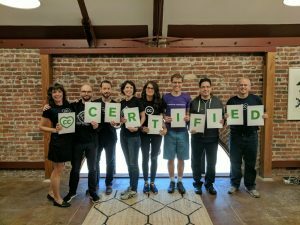 After running the first year of Certificate courses, we’ve gathered feedback from hundreds of participants, and from people who would like to get CC Certified in the future. Based on your feedback and the global demand for the CC Certificate courses, we are proud to announce the following upgrades for 2019. We will now offer a Certificate Instructor training program, starting in January, 2019. The CC Certificate Facilitator Training will develop a growing network of qualified professionals who can expertly instruct future classes, and help us meet the need for more Certificate classes. We are determined to make the CC Certificate available and accessible to community members of all income levels, around the world. We will be putting CC funding into a scholarship program starting in 2019. To help fund scholarships, we will devote a portion of the standard CC Certificate ticket price to the scholarship fund. Find out more information about the Certificate, and upcoming opportunities to become a Certificate Facilitator here. Please note that earning a CC certificate will not authorize you to provide legal advice, represent your opinions as official interpretations of CC tools, or speak on behalf of Creative Commons or its Network Chapters. What’s Next for the Certificate Program?